Should You Unsubscribe from Sweepstakes Newsletters? Will unsubscribing expose you to spam, scams, or disqualification? If you have been entering sweepstakes for a while, chances are that your dedicated sweepstakes email address is receiving many new mails each day. Should you unsubscribe from these sweepstakes emails? Keeping Your Email Account Tidy is Important! Unsubscribing is an important issue, because you don't want your sweepstakes email to become so overcrowded that you miss important emails, including win notifications. In an ideal world, every win notification would be crystal clear and easy to spot with a quick scan of your inbox. However, we don't live in an ideal world, and spotting a win in your email can be tricky. Even trickier if you have to sort through huge amounts of new mail to find them. To ensure you don't miss a win, I recommend opening and scanning through the sweepstakes emails you receive, and being extra sure to check your spam folder for win notifications that might get misfiled by your email provider. But dredging through hundreds of emails stops feeling like a fun hobby, and starts to resemble work quickly. Oftentimes, that means that you will procrastinate and start checking your email less and less... maybe, eventually, not at all. Which could be a reason why you're not winning enough sweepstakes. So you don't want to let your inbox get so overcrowded that checking it feels like a chore. To keep your sweepstakes email manageable, I recommend being proactive about the emails you receive. If you're not interested in a newsletter, unsubscribe before your inbox gets out of hand. The sweepstakes is still running. 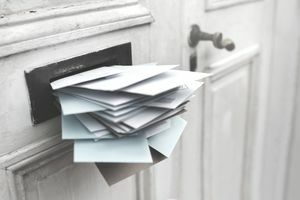 Some sponsors choose their winners from among the entrants who are still subscribed to their email list, OR their only notification method is through a post in their regular emails. You can read the rules of each sweepstakes to ensure that you are not disqualifying yourself by unsubscribing, or you can simply wait until the giveaway is over and the winner has been announced to say goodbye. You enjoy the emails. Adding new people to their email list is one of the major reasons why companies run sweepstakes to begin with. To support companies who give us chances to win, I always encourage sweepers to give the emails a chance. You may receive valuable coupons and special offers, helpful information, or simply entertainment. If you like the emails, there's no need to unsubscribe (although if they get to be too many, you can always subscribe with a different email address and unsubscribe with your sweepstakes email). You want to get news about future giveaways. Many companies send news about future giveaways to their email lists. If you want to be one of the first to know about new sweepstakes, keep your subscription to these types of newsletters. But What About Spam and Scams? Reading your sweepstakes emails and unsubscribing from the ones you don't want to receive is a smart thing to do with legitimate emails, but you don't want to interact with spam and scam emails any more than necessary. So how do you avoid the bad mails? Keep spammers from getting your email address. While there's no foolproof way to prevent your email address from falling into the hands of crooks, you can take some simple steps to make abusing it more difficult. Read How to Protect Your Email from Spam and Scams for more details. Use a modern email provider. Most email providers these days provide tools to protect you from scams, including blocking images from untrusted senders, thus preventing them from knowing you opened their mail, and that your email address is active. Follow US CERT's email recommendations. The US Computer Emergency Readiness Team (US CERT) has compiled a PDF File with helpful tips to Recognize and Avoid Email Scams. Some important tips include not clicking on links in untrustworthy emails, treating attachments with caution, and installing and updating antivirus software and firewalls. Know the warning signs of scams. Many of the warning signs of sweepstakes scams apply to untrustworthy emails, too. Soliciting money, terrible spelling and grammar, addressing you by a generic term (aka, "dear customer"), etc. are signs that you shouldn't interact with the mail. If you feel an email is not from a legitimate source, simply mark it as spam and delete it. Don't click any links, and don't try to unsubscribe. And if your sweepstakes email does get too overwhelming, you can always start over with a new address. Sign Up for Our Free Sweepstakes Newsletter to get tips and advice delivered directly to your inbox twice every week! We respect your privacy. Will Entering Sweepstakes Get You Spammed? Not If You Follow These Tips!